It’s Always Sunny in Philadelphia – In “Frank Reynolds’ Little Beauties,” the gang takes on toddlers and tiaras when Frank produces his own kiddie beauty pageant, then worries people will think he’s a perv. Which, of course, he is, but not in this instance. The Big Bang Theory – Leonard and Amy get to know each other when he accompanies her to a wedding. Meanwhile, Bernadette and Howard spend the weekend with Mrs. Wolowitz. Community – Freaks and Geeks star Martin Starr plays the gang’s professor, and advisor for a Model United Nations project, while Chang takes to his new campus security guard a little too enthusiastically. How to Be a Gentleman – It’s Always Sunny in Philadelphia co-star and producer David Hornsby (he plays Rickety Cricket) stars in this new sitcom about a magazine etiquette columnist who’s told by his boss to modernize his column. His solution: hire his former high school bully nemesis (Entourage star Kevin Dillon) to be his life coach. Should you watch? Eh. Kevin Dillon is essentially playing Johnny Drama (which I don’t mean as a compliment), and everything else about the show feels very been there, done that. 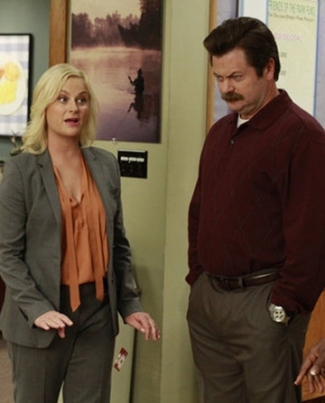 Parks and Recreation – The former Mrs. Ron Swanson, Tammy One (guest star Patricia Clarkson), returns to wreak even more havoc on Ron’s (Nick Offerman) life, while Ben tries to help Tom get his new company’s finances on track. Grey’s Anatomy – The chief makes a major career decision, while the fifth-year residents get their first chance to perform solo surgeries. The Office – Robert (James Spader) motivates the sales staff with a rousing speech … and a major prize for the top dog. Project Runway – The designers have to whip up ’70s-inspired frocks. The Mentalist – Jane gets his job back, but when he’s assigned to a new team, he plots to get Lisbon and the crew back. Archer – In the conclusion of the “Heart of Archness” saga, Archer and company escape from the pirate island. – On the fifth season premiere of Private Practice (10PM, ABC), Pete has a heart attack and Addison plots having a baby with Jake (Benjamin Bratt). – Last Call with Carson Daly (1:35AM, NBC): Sons of Anarchy creator Kurt Sutter. Parks and Recreation – So harsh: Leslie (Amy Poehler) has to choose between Ben (Adam Scott) and her dream of running for political office. Meanwhile, one Tammy ex-wife isn’t enough for Ron Swanson (Nick Offerman): his first Tammy ex is headed back into his life, and she looks a lot like big-screen star Patricia Clarkson. Because she is. Big Bang Theory – Penny’s so upset about sleeping with Raj that she considers leaving town, while Sheldon becomes a paintball cap’n on the one-hour season opener. Community – The Wire‘s Michael K. Williams guest stars as Jeff’s new biology teacher (who kicks Mr. Winger out of class) and the great John Goodman plays the recurring role of Greendale Vice Dean Laybourne, the head of the Greendale Air Conditioning Repair Annex, and the new thorn in the side of beleaguered Dean Pelton. The X Factor – The early auditions continue. What did you think of the new show and the return of Simon Cowell? Grey’s Anatomy – Meredith is bounced after messing with McDreamy’s clinical trial. The Office – New Sabre CEO Robert California (James Spader) starts his job, but we still don’t know who the new Scranton boss will be …. Person of Interest – Love the cast – Jim Caviezel and Lost‘s Michael Emerson – but the pilot of this drama, about a CIA agent who’s presumed dead (Caviezel) and the super wealthy software developer (Emerson) he teams with to try to prevent crimes before they happen, didn’t really grab me. But again, with that cast, and a good general premise (not to mention J.J. Abrams as producer), it’s worth checking out for a few episodes. Project Runway – The designers have to whip up rockin’ threads for the rock band the Sheepdogs, while American Idol alum Adam Lambert is the guest judge. Whitney – NBC’s Thursday-night comedy line-up has 30 Rock, Parks and Recreation, Community, The Office … and now Whitney. Which one of these things is not like the others? It’s the unfunny one, by which I mean Whitney. But if that promo in which Whitney’s (titular comedienne star Whitney Cummings) busted for eating a cupcake at a wedding entices you to watch anyway, come back and share your feelings with the group, by which I mean the comments, afterwards. 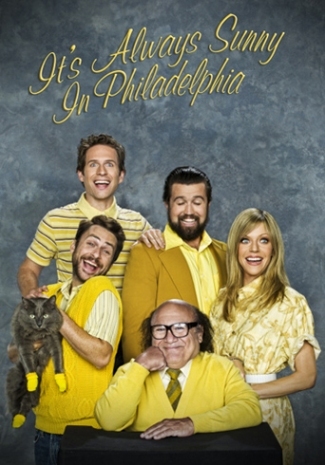 It’s Always Sunny in Philadelphia – Dennis and Sweet Dee take the gang to the Jersey Shore, where they spent several happy summers. Now … not so happy for them. The Mentalist – Jane is in prison and has to prove the man he killed was Red John. Prime Suspect – My biggest issue with this remake of the British female homicide detective drama that originally starred Helen Mirren (and stars Mario Bello in this American remake) is that, after a night of comedy on NBC, do you really want to slide into murder at 10PM? Archer – The ISIS gang keeps trying to rescue Archer, who doesn’t want to be found, because he’s happily ensconced as the new pirate king on the island. – It’s the series premiere of Sweet Genius (10PM, Food Network), a new dessert competition series in which pastry chefs compete to win $10,000 for their confections. – Last Call with Carson Daly (1:35AM, NBC): Doug Elin. 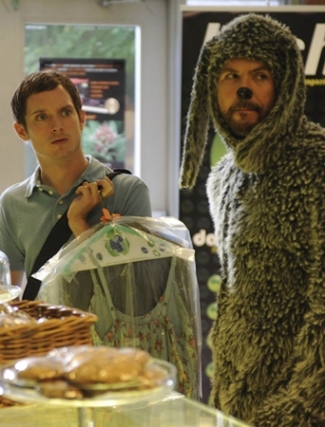 Wilfred – Only one more Wilfred before next week’s season finale. Sad. But tonight’s installment is a good one: An attractive woman is interested in Ryan, but he’s preoccupied with doing for others, including Kristen, Jenna and, of course, Wilfie. Rising: Rebuilding Ground Zero – The miniseries concludes with episodes featuring 9/11 survivors who hung around to help rebuild their communities and a memorial for 9/11 victims. Burn Notice – Sam and Jesse try to trap Max’s killer while Michael and Fiona pretend to be a wealthy couple at a swanky South American resort to rescue a bioweapons expert. Degrassi – It’s prom night, and on Degrassi, that means someone’s probably gonna get shot. Project Runway – Kenneth Cole is the guest judge as the contestants have to create garments inspired by student art projects. Futurama – When Bender gets a boost in his processing power, he’s suddenly able to see the future. A prescient Bender … all kinds of potential there. Suits – Harvey’s mentor shows up and asks for Harvey’s help when the mentor’s office comes under investigation. 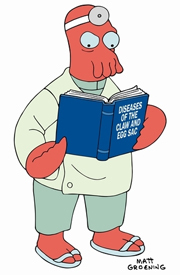 The best part: said mentor is played by guest star Gary Cole, who always elevates whatever project he’s in. Childrens Hospital – In “Newsreaders,” we get updates on the Childrens Hospital (remember, no apostrophe!) cast. The crazy, crazy cast. NTSF: SD: SUV – Trent (Paul Scheer) plans a cruise for the NTSF crew, but he has an ulterior motive: to catch a terrorist who’s allegedly hiding on the ship. – On Louie (10:30PM, FX), Louie’s sister wigs out and takes her daughter to Grand Central Station … and leaves her there. – Last Call with Carson Daly (1:35AM, NBC): Sarah Vowell (REPEAT). Rising: Rebuilding Ground Zero – Ground Zero will ultimately be a 16-acre complex that includes four skyscrapers, a transportation hub, a museum and a 9/11 memorial with the largest man-made waterfall in history. This miniseries, produced by Steven Spielberg, documents the construction, including the remembrances of those who were in lower Manhattan on Sept. 11, 2011 and those who are involved now in this massive, emotional rebuilding effort. Burn Notice – Michael worms his way inside a group of hijackers as a way to help Jesse with a security job, but he’s caught by surprise when the hijackers take hostages at an airport. And the person trying to help the hostages escape? Maddie, of course. Project Runway – Survivor meets PR? The designers not only have to conceive a new frock based on sneakers and sportswear, but they actually have to participate in a running event. Jersey Shore – They’ve been teasing it for months, and tonight we finally see the big throwdown between Ronnie and The Situation. Oh, I feel just a little bit more ridiculous every time I type that name. Wilfred – Dwight Yoakam guest stars as a guy who may confirm Ryan’s suspicions that his friendship with Wilfred may not be totally healthy. Childrens Hospital – Glenn (Ken Marino), finally, gets a bar mitzvah. NTSF: SD: SUV – Gabrielle Union guest stars in “Tijuana, We’ve Got a Problem,” as plans for the space shuttle are stolen and sold to Mexico, and Trent (Paul Scheer) and the gang must retrieve them. – On Louie (10:30PM, FX), Louie … Afghanistan … comedy ensues. Wilfred – Back-to-back new episodes of Wilfred kick off with Ryan’s mom (guest star Mary Steenburgen) checking out of the “wellness center” where she’s lived for 20 years and moving in with her son. Ryan already has a contentious relationship with his wacky mama, and the fact that Wilfred bonds with her just gives him another reason to resent her. And in the second ep, Wilfred picks on Ryan and tells him that people are starting to call him weird because he spends so much time alone, but Wilfie’s motives, of course, are not all about what’s best for Ryan. Burn Notice – While Fiona and Jesse do some sleuthing on behalf of a drug company mogul (who’s hiding secrets from them), Sam helps Michael track down a bomb maker who has some scoop related to Max’s murder. 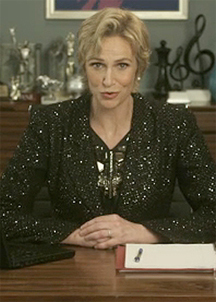 Do Something Awards – Jane Lynch hosts (few TV promos have been as entertaining as the ones she’s done leading up to the Do Something show) and Foster the People and OneRepublic perform in this nod to social do-gooding. Among the presenters doling out awards: Adam Lambert, Nick Cannon and Kristen Bell. Project Runway – I think Michael Kors himself would be at least a little nervous about working with the client the contestants have to design for tonight: Judge Nina Garcia. Beyond Scared Straight – It’s tough to tell sometimes how effective the show’s prisoners are in persuading teens that crime doesn’t pay, but I find their schtick so scary as to make me reconsider taking a cent from the Take a Penny dish at the local bodega. Jersey Shore – It hits the fan when Mike tells the whole house he and Snooki hooked up, and Deena proves that, yes, she can get even sloppier when she hooks up with twins Vinny and Mike had their eyes on. 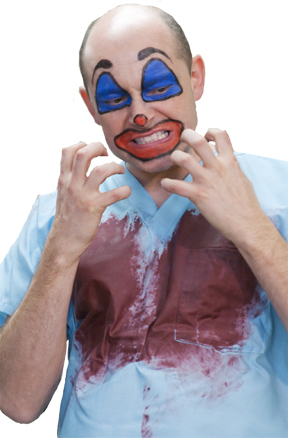 Childrens Hospital – In “The Chet Episode,” we experience a day in the life of the creepy paramedic. NTSF: SD: SUV – Trent’s (Paul Scheer) on the trail of a serial killer (a dolphin serial killer), and looks to a another murderer, who’s locked up, for help. Tonight’s guest star: Tony “Buster Bluth” Hale. – Louie (11PM, FX) takes the girls trickor-treating and finds himself having to explain Lilly’s costume. – Last Call with Carson Daly (1:35AM, NBC): Neil Strauss (REPEAT).